“All the darkness in the world cannot extinguish the light of a single candle” — St. Francis of Assisi! We love people. 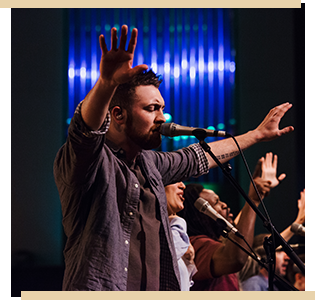 Our community is made up of local Church songwriters, artists and worship leaders. According to Eph 5:21 we submit our individual stylistic bents and denominational preferences to allow our talent and creativity to become the tools with which we love and unite as one. Our prayer is that we would use our gifts to applaud and serve others rather than seeking applause and service from others. A. It will be held at the Four State Fair Ground Arena. Address: 3700 50th St, Texarkana, AR 71854. A. Please come comfortable. Its going to be a beautiful day of friendship, fun, worship, prayer, food and fellowship. Dress casual, settle-in, relax and enjoy the day. A. Absolutely, children welcome. But please remember this is a Live Recording Event so we need to keep it quiet! Oh, but do sing! By all means sing! A. Possibly no, possibly yes. Do be aware that your attendance grants permission to capture you on film and use your likeness. A. The short answer is yes. However, we highly recommend advance purchase. Please purchase tickets online at www.turnupthelights.org. A. You may know some; you will not know others, but they will be easy to learn. We will be singing and recording many of the songs written specifically for our region and for this event. We encourage you to sing and blend in with the rest of the room. 1. You get to be a part of an experience that will exist far beyond the day. 2. Unlike usual festivals full of noise, this festival will be full of music and singing captured on CD. Therefore, it becomes imperative that noise other than singing is eliminated. We will all be doing the same thing at the same time during the musical parts of the day. 3. The live recording is being professionally captured to be turned into a record that you will be able to purchase when done.